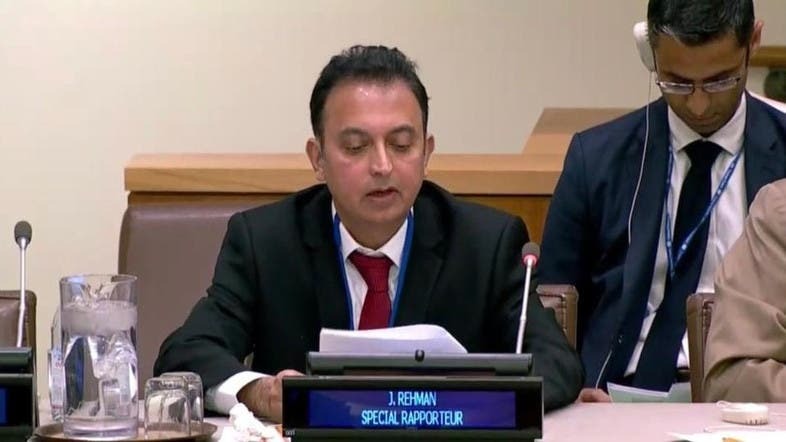 The UN Special Rapporteur on the human rights situation in Iran, Javid Rehman, presented his report in his first mission, in front a UN panel in New York on Wednesday, with the United Kingdom, United States and the European Union criticizing the increase in executions and suppressions inside the Islamic Republic. Rehman, a British-Pakistani legal scholar, reported that Iran has witnessed lately a wave of protests against the economic and living conditions which the authorities tried to suppress. Rehman called on the Iranian government to allow him to visit the country in order to assess the human rights situation through interviews with Iranian citizens and to provide information on reports provided by international human rights organizations on violations, particularly executions, torture, suppression of freedom of assembly, opinion and expression, as well as depriving religious and ethnic minorities of their fundamental rights. Following the UN meeting, Javed held a press conference at the UN building where he expressed concern about the fate of the environmental activists held for months in Iran. The UN Special Rapporteur also considered the arrest of women against the compulsory hijab as a violation of human rights and international laws, while expressing concern about the fate of the detainees of protests in recent months in various cities in Iran. Rahman stressed that the United Nations monitors the protests in Iran, especially the suppression and abuse of detainees, which led to the death of some people in prisons. The UN Rapporteur pointed to a wave of suppression and threats against journalists, as well as the imprisonment of dual citizens and the execution of political prisoners, especially members of minorities. He called on the Iranian government to interact with him to bring about positive changes in the human rights situation. He revealed that he held two meetings with representatives of Iran in Geneva and New York, wrote letters and held talks to decide on his request to visit the country.